In this paper, we will study the field through the problematic network built by scientific articles, using actor-network theory (and consequently coword analysis) as a model for scientific knowledge (regarded as a social process) growth. 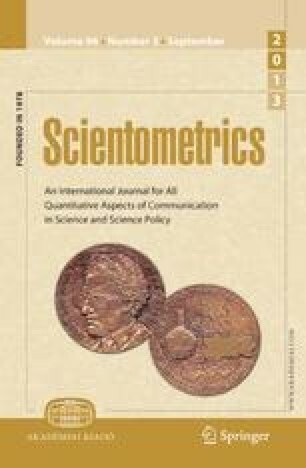 Scientometrics is an hybrid field made of invisible college and a lot of users, thus controlled by both scientific research and final uses. Coword analysis gives the same weight to all articles, cited or not, and consequently computes the interaction network within all kind of authors. According to already described network properties of scientific interaction, coword analysis describes the dynamic of the field in accordance with what has been observed, and suggest forecast for the future.